We accumulate a lot of toxins, dark sludge, in our energy fields, during the course of our daily lives. 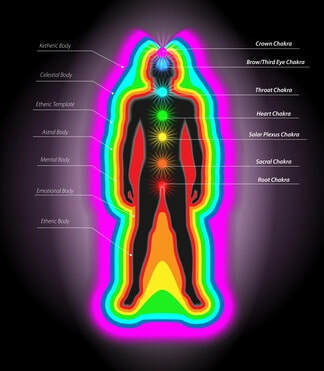 The human energy field is like an onion with many layers, many chakras, and many patterns of energy in the field that formed over the course of many lifetimes. Each of these patterns serves a purpose, such as learning. The energy field layers, the chakras, the energy patters, the organs, and cells all accumulate physical, energetic, and emotional toxins. Some of them come from our environment and from other people, and some are of our own making. Some of these patterns are within the energy matrix of that energy body, which survives bodily death, and follow us from lifetime to lifetime, as we reincarnate. If we don’t detox regularly with fasting, herbal and juice detoxes, and don’t cleanse our energy regularly with some form of energy clearing and cleansing, the accumulated toxins will clog up the system, and eventually it will not work as well, leading to a health decline. In the extreme case, organs or chakras can simply stop functioning. Many people don’t detox or cleanse at all, until they have physical symptoms of illness. Then they go and get medications, that seek to mask the symptoms, but do not resolve the root cause of the problem - toxicity and poisoning. It is important for every person to do regular detoxing of all organs and energetic cleansing of all chakras to prevent disease and disfunction. In her work, Arriale is assisted by the Archangels, Angels, Spirit Guides, and other helpful, compassionate light beings of heaven and earth. Arriale uses crystals, herbs, sage, sweet grass, palo santo, feathers, stones, essential oils, a drum, rattle, candles, and other shamanic tools.